Interested in Smoother, Clearer, Younger-Looking Skin in a Week? Fractional CO2 Resurfacing: A wonderful treatment that gives you great results with a single treatment! Platelet Rich Plasma (PRP) Therapy: One of the hottest new things in aesthetic medicine, PRP uses your body’s own healing process to refresh and rejuvenate. Attendees will enjoy refreshments, a raffle, and exclusive specials at our event. Smooth and youthful-looking skin can be yours with our new and improved medical spa treatment: Sublative Rejuvenation + DNA Repair! Sublative Rejuvenation is one the of the best skin resurfacing procedures available and involves little to no pain and now includes DNA CryoStem Therapy to enhance your results. Sublative Rejuvenation uses Radio Frequency (RF) energy that is applied to the skin to induce a skin “injury” in tiny matrix spots. The skin “injury” is bigger under the surface (like an inverted cone) than on the surface. This helps the skin heal faster. As the skin heals, levels of collagen will be increased and new healthy skin cells are produced. How does DNA Repair enhance the treatment? Adding the DNA serum immediately after the skin resurfacing treatment supercharges the rejuvenation procedure because the CryoStem Therapy serum is packed with collagen, hyaluronic acid, elastin, DNA, RNA(I), fibroblasts, lipids, antioxidants, vitamins and embryonic bovine stem cells. These building blocks of the skin maximizes skin renewal. The DNA CryoStem Therapy consists of 100% natural, chemical and preservative free formulations. Is there downtime with this skin resurfacing treatment? There is no downtime with Sublative Rejuvenation + DNA Repair. Clients may develop tiny scabs (smaller than a pin prick) from the matrix spots that are barely visible and can be covered with makeup. These usually slough off quickly. 30 minutes prior to the treatment we apply a physician-strength topical numbing treatment. With the topical numbing, clients report little to no pain. How many treatments are recommended and when can I see results? The total number of treatments depends upon your skin’s condition. Your Evolutions clinician can help determine what is right for you at your complimentary consultation. Typically, clients have 4 treatments, 4 to 6 weeks apart. Results are noticeable within 1 to 2 weeks after the first treatment and are cumulative, therefore we encourage clients to stay on schedule with their treatments. How much does Sublative Rejuvenation + DNA Repair cost? Price can vary according to the number of total treatments and the areas treated. For the month of January, we are offering an Introductory Special of 25% off Sublative Rejuvenation + DNA Repair Treatment and Packages. The promotion is good until January 31, 2013 so call today to book your treatment or consultation at Evolutions Medical Spa in Santa Barbara – 805-687-0212. Special Evolutions Spa Event Tonight! Santa Barbara’s Evolutions Medical Spa October Event is one of the most popular so RSVP as soon as possible to Evolutions at 805.687.0212. Learn how you can tighten your skin without surgery! Evolutions Medical Spa and cosmetic surgeon Dr. Terry Perkins use advance technology to offer innovative skin solutions including a unique protocol developed by Dr. Perkins combining two top non-invasive skin tightening technologies, ReFirme and Titan, to create Total Tightening (available exclusively at Evolutions). Evolutions also has the newest fractional skin resurfacing treatment – Sublative Rejuvenation – that offers results with little to no pain. We will also discuss a number of options to lighten excess pigmentation or effectively control excess pigmentation with a variety of products and professional treatments. Enjoy refreshments, enter in a raffle and take part in exclusive specials for attendees only. 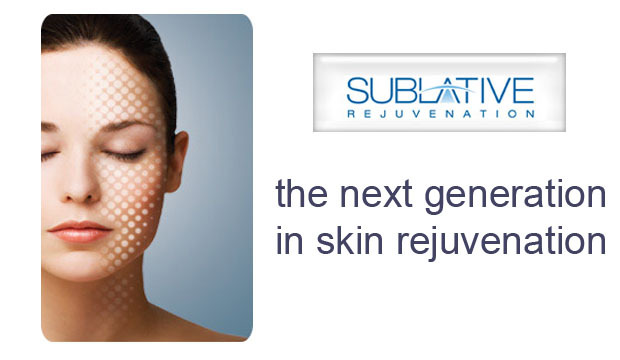 Sublative Rejvenation is safe to use on all skin types. Even better, it involves little to no pain! During our trial investigations, with the application of medical topical numbing cream 30 minutes prior to the procedure, most clients rated the discomfort level at a “2” or less on a scale of 1 to 10. Now through September 30th, 2010! Purchase a single Sublative Rejuvenation treatment before the end of the month for 50% off! The first 5 approved clients who allow us to use their before and after pictures for marketing purposes will receive the rest of the full series (4 treatments in all) for 50% off. Everyone else will receive 25% off the price of the series. Call Evolutions at 805.687.0212 to book your appointment or complimentary consultation to learn more about Sublative Rejuvenation.